for the current version of Accumulate. 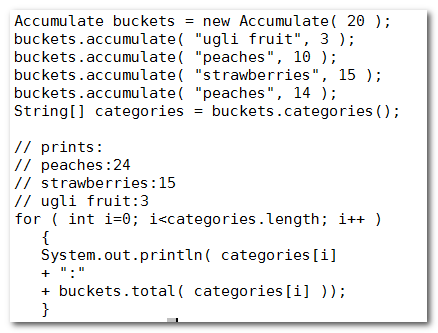 Accumulates values by category, and display results in sorted order, e.g. timesheet data by activity code. 91K zip for Accumulate Java source and compiled class files to run on your own machine as a part of your own program. access accumulate source in repository with [Tortoise] Subversion client on wush.net/svn/mindprod/com/mindprod/accumulate/. 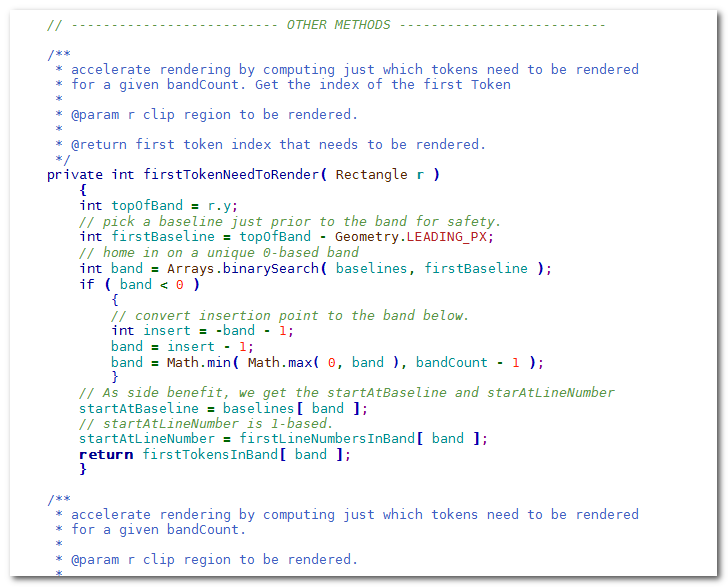 download ASP PAD XML program description for the current version of Accumulate. Accumulate is free. Full source included. You may even include the source code, modified or unmodified in free/commercial open source/proprietary programs that you write and distribute. Non-military use only. for the current version of American State Sales Tax Calculator. Note it may require adding tables for the states/counties you need. It comes with complete state and county tax tables for all 50 states. 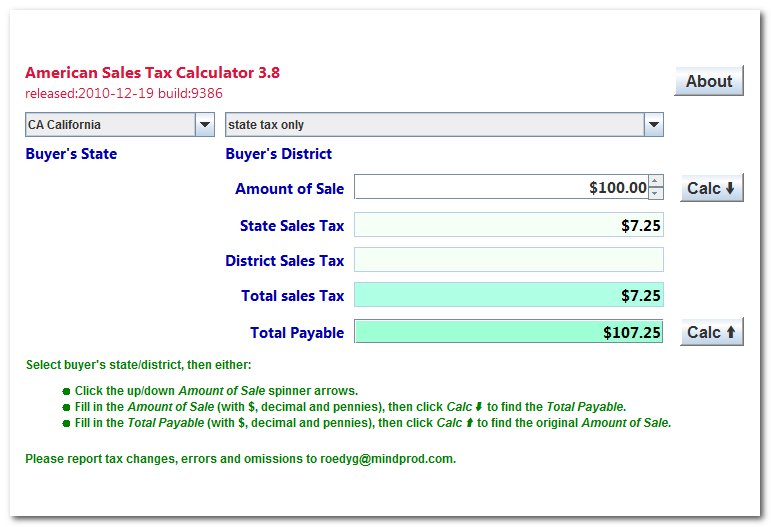 American State Sales Tax Calculator online as an Applet in your browser, without installing it on your computer. 1,491K zip for American State Sales Tax Calculator Java source, compiled class files, jar and documentation to run on your own machine either as an application or an Applet. access americantax source in repository with [Tortoise] Subversion client on wush.net/svn/mindprod/com/mindprod/americantax/. download ASP PAD XML program description for the current version of American State Sales Tax Calculator. American State Sales Tax Calculator is free. Full source included. You may even include the source code, modified or unmodified in free/commercial open source/proprietary programs that you write and distribute. Non-military use only. for the current version of Borders. Borders online as an Applet in your browser, without installing it on your computer. 456K zip for Borders Java source, compiled class files, jar and documentation to run on your own machine either as an application or an Applet. access borders source in repository with [Tortoise] Subversion client on wush.net/svn/mindprod/com/mindprod/borders/. 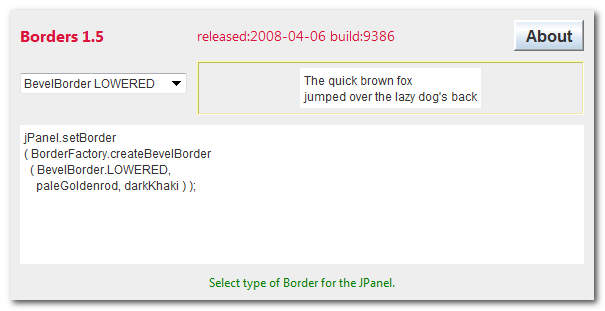 download ASP PAD XML program description for the current version of Borders. Borders is free. Full source included. You may even include the source code, modified or unmodified in free/commercial open source/proprietary programs that you write and distribute. Non-military use only. for the current version of ColorSaver. 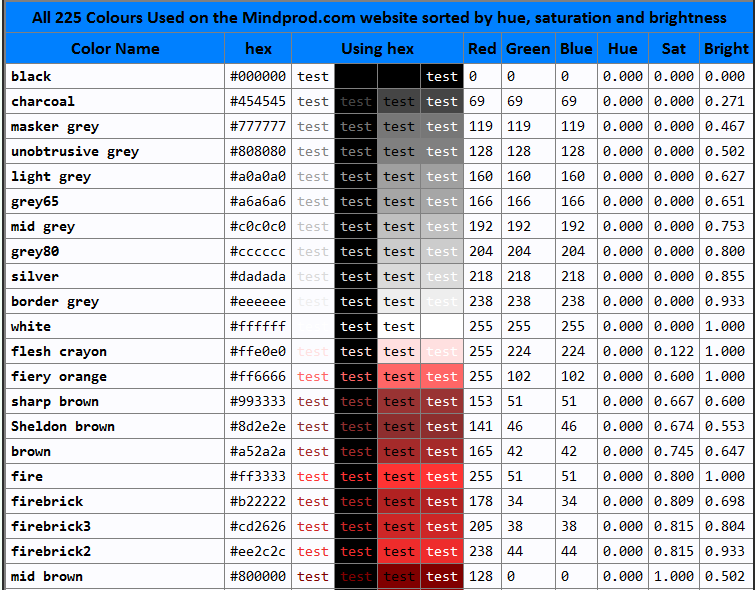 Ensures Color objects are shared rather than duplicated. 102K zip for ColorSaver Java source and compiled class files to run on your own machine as a part of your own program. access colorsaver source in repository with [Tortoise] Subversion client on wush.net/svn/mindprod/com/mindprod/colorsaver/. download ASP PAD XML program description for the current version of ColorSaver. ColorSaver is free. Full source included. You may even include the source code, modified or unmodified in free/commercial open source/proprietary programs that you write and distribute. Non-military use only. for the current version of Connectors. Draws various electrical connectors. Teaches how to use Swing, JPanel.paintComponents and transparency drawing tools. 627K zip for Connectors Java source and compiled class files to run on your own machine as a part of your own program. access connectors source in repository with [Tortoise] Subversion client on wush.net/svn/mindprod/com/mindprod/connectors/. download ASP PAD XML program description for the current version of Connectors. Connectors is free. Full source included. You may even include the source code, modified or unmodified in free/commercial open source/proprietary programs that you write and distribute. Non-military use only. 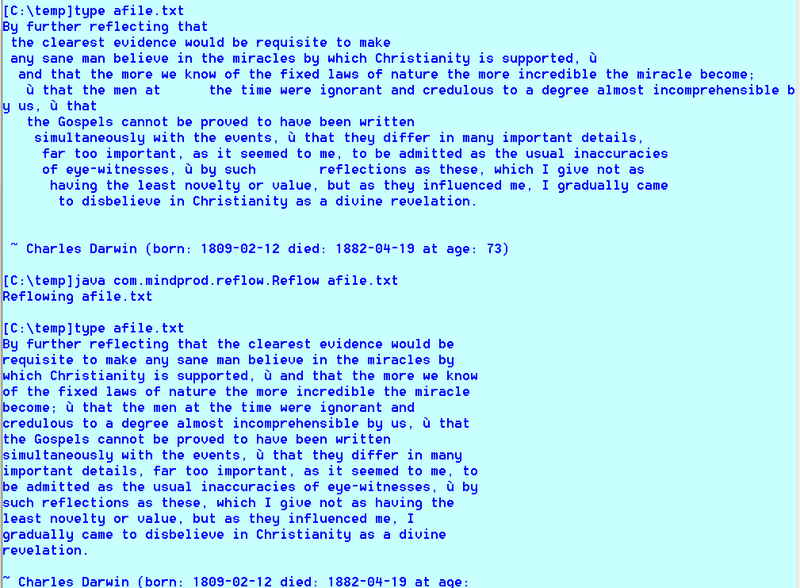 Encodings online as an Applet in your browser, without installing it on your computer. for the current version of Echo Server. 102K zip for Echo Server Java source and compiled class files to run on your own machine as a part of your own program. access echoserver source in repository with [Tortoise] Subversion client on wush.net/svn/mindprod/com/mindprod/echoserver/. download ASP PAD XML program description for the current version of Echo Server. Echo Server is free. Full source included. You may even include the source code, modified or unmodified in free/commercial open source/proprietary programs that you write and distribute. Non-military use only. Encoding Recogniser online as an Applet in your browser, without installing it on your computer. Esperanto Tradukilo Vortope online with Java Web Start. for the current version of JDisplay. Displays Java, HTML, bat, SQL, ini, csv, xml properties… source. JDisplay online as an Applet in your browser, without installing it on your computer. 4.2MB zip for JDisplay Java source, compiled class files, jar and documentation to run on your own machine as an Applet. access jdisplay source in repository with [Tortoise] Subversion client on wush.net/svn/mindprod/com/mindprod/jdisplay/. download ASP PAD XML program description for the current version of JDisplay. JDisplay is free. Full source included. You may even include the source code, modified or unmodified in free/commercial open source/proprietary programs that you write and distribute. Non-military use only. for the current version of HeapSort. Internal sort, good when data are already almost sorted. 80K zip for HeapSort Java source and compiled class files to run on your own machine as a part of your own program. access heapsort source in repository with [Tortoise] Subversion client on wush.net/svn/mindprod/com/mindprod/heapsort/. download ASP PAD XML program description for the current version of HeapSort. HeapSort is free. Full source included. You may even include the source code, modified or unmodified in free/commercial open source/proprietary programs that you write and distribute. Non-military use only. for the current version of KeyPlayer. Keystroke Event tutor. Teaches you about keystroke and mouse events by logging details about every event you generate as you click the screen or hit keystrokes. Can also diagnose defective keyboards. 612K zip for KeyPlayer Java source, compiled class files, jar and documentation to run on your own machine as an application. access keyplayer source in repository with [Tortoise] Subversion client on wush.net/svn/mindprod/com/mindprod/keyplayer/. 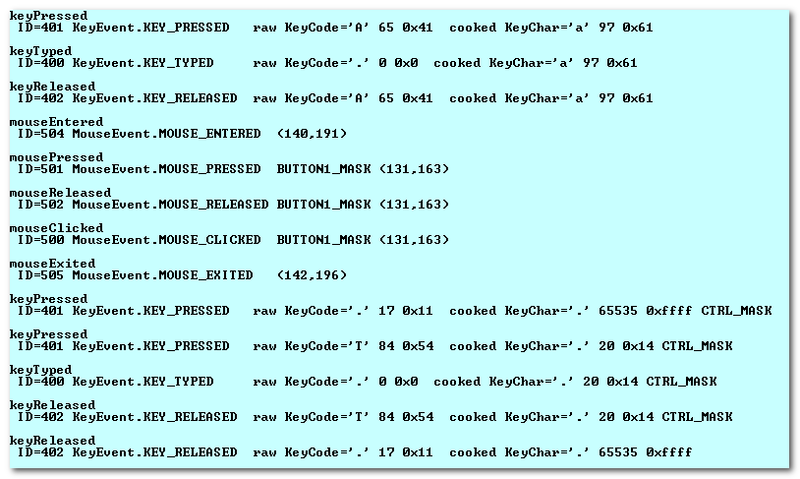 download ASP PAD XML program description for the current version of KeyPlayer. KeyPlayer is free. Full source included. You may even include the source code, modified or unmodified in free/commercial open source/proprietary programs that you write and distribute. Non-military use only. for the current version of LinkedList. 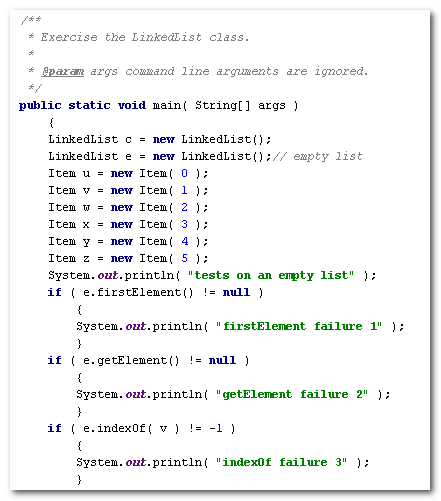 LinkedList Java class. Predates java.util.LinkedList. 94K zip for LinkedList Java source and compiled class files to run on your own machine as a part of your own program. access linkedlist source in repository with [Tortoise] Subversion client on wush.net/svn/mindprod/com/mindprod/linkedlist/. download ASP PAD XML program description for the current version of LinkedList. LinkedList is free. Full source included. You may even include the source code, modified or unmodified in free/commercial open source/proprietary programs that you write and distribute. Non-military use only. on the current version of Mutex. Mutex thread package. Written my Farsight systems, not CMP. 31K zip for Mutex Java source and compiled class files to run on your own machine as a part of your own program. Mutex is free. Full source included. You may even include the source code, modified or unmodified in free/commercial open source/proprietary programs that you write and distribute. Non-military use only. for the current version of Official Encoding. Tells you the official name of any given encoding and whether Java supports it. Official Encoding online as an Applet in your browser, without installing it on your computer. 534K zip for Official Encoding Java source, compiled class files, jar and documentation to run on your own machine either as an application or an Applet. access officialencoding source in repository with [Tortoise] Subversion client on wush.net/svn/mindprod/com/mindprod/officialencoding/. 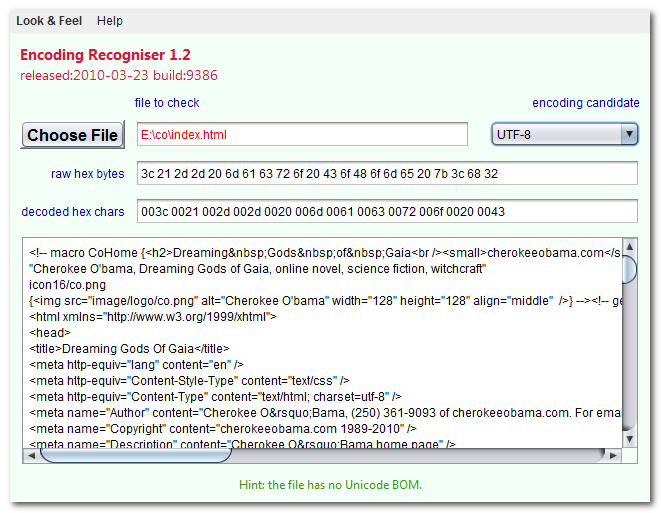 download ASP PAD XML program description for the current version of Official Encoding. Official Encoding is free. Full source included. You may even include the source code, modified or unmodified in free/commercial open source/proprietary programs that you write and distribute. Non-military use only. for the current version of Palette. 3.4MB zip for Palette Java source, compiled class files, jar and documentation to run on your own machine as an application. access palette source in repository with [Tortoise] Subversion client on wush.net/svn/mindprod/com/mindprod/palette/. download ASP PAD XML program description for the current version of Palette. Palette is free. Full source included. You may even include the source code, modified or unmodified in free/commercial open source/proprietary programs that you write and distribute. Non-military use only. 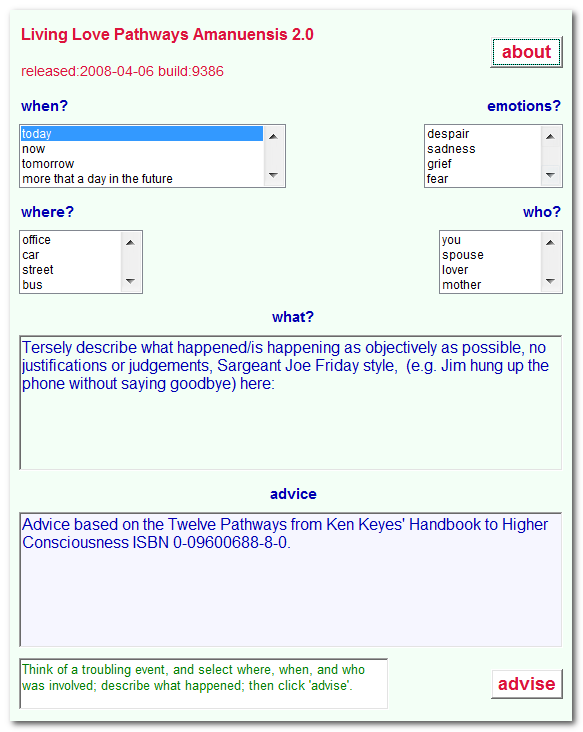 Pathways Amanuensis online as an Applet in your browser, without installing it on your computer. for the current version of Primes. 65K zip for Primes Java source and compiled class files to run on your own machine as a part of your own program. access primes source in repository with [Tortoise] Subversion client on wush.net/svn/mindprod/com/mindprod/primes/. download ASP PAD XML program description for the current version of Primes. Primes is free. Full source included. You may even include the source code, modified or unmodified in free/commercial open source/proprietary programs that you write and distribute. Non-military use only. for the current version of QuickSort. 75K zip for QuickSort Java source and compiled class files to run on your own machine as a part of your own program. access quicksort source in repository with [Tortoise] Subversion client on wush.net/svn/mindprod/com/mindprod/quicksort/. 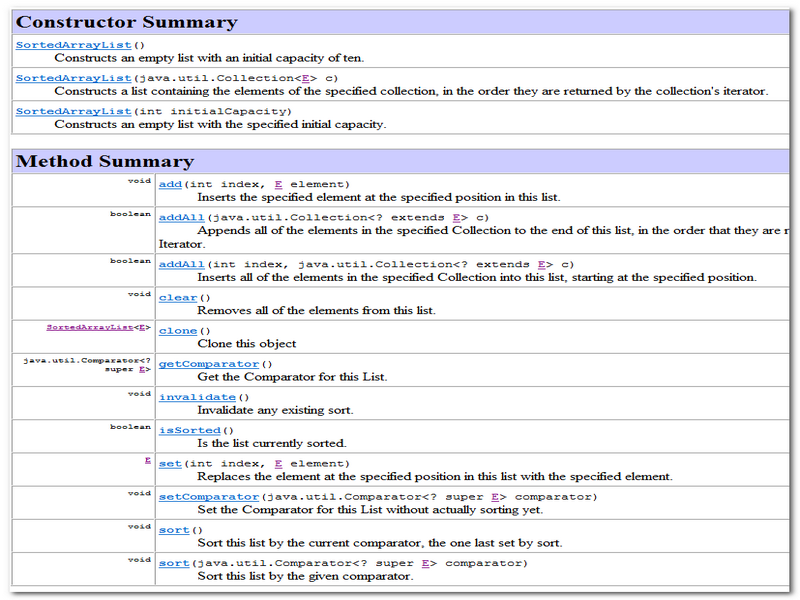 download ASP PAD XML program description for the current version of QuickSort. QuickSort is free. Full source included. You may even include the source code, modified or unmodified in free/commercial open source/proprietary programs that you write and distribute. Non-military use only. for the current version of RadixSort. 101K zip for RadixSort Java source and compiled class files to run on your own machine as a part of your own program. access radixsort source in repository with [Tortoise] Subversion client on wush.net/svn/mindprod/com/mindprod/radixsort/. download ASP PAD XML program description for the current version of RadixSort. RadixSort is free. Full source included. You may even include the source code, modified or unmodified in free/commercial open source/proprietary programs that you write and distribute. Non-military use only. for the current version of Reflow. Reflows a text file to make all lines roughly the same length. 195K zip for Reflow Java source, compiled class files, jar and documentation to run on your own machine as an application. access reflow source in repository with [Tortoise] Subversion client on wush.net/svn/mindprod/com/mindprod/reflow/. download ASP PAD XML program description for the current version of Reflow. Reflow is free. Full source included. You may even include the source code, modified or unmodified in free/commercial open source/proprietary programs that you write and distribute. Non-military use only. for the current version of Screws. Draws eight screw/screwdriver types. Teaches how to use Java Canvas, fillRect, fillOval, fillPoly and AffineTransform to draw. 78K zip for Screws Java source and compiled class files to run on your own machine as a part of your own program. access screws source in repository with [Tortoise] Subversion client on wush.net/svn/mindprod/com/mindprod/screws/. download ASP PAD XML program description for the current version of Screws. Screws is free. Full source included. You may even include the source code, modified or unmodified in free/commercial open source/proprietary programs that you write and distribute. Non-military use only. for the current version of ShellSort. Internal sort, good for small sorts under 2000 items. 91K zip for ShellSort Java source and compiled class files to run on your own machine as a part of your own program. access shellsort source in repository with [Tortoise] Subversion client on wush.net/svn/mindprod/com/mindprod/shellsort/. download ASP PAD XML program description for the current version of ShellSort. ShellSort is free. Full source included. You may even include the source code, modified or unmodified in free/commercial open source/proprietary programs that you write and distribute. Non-military use only. 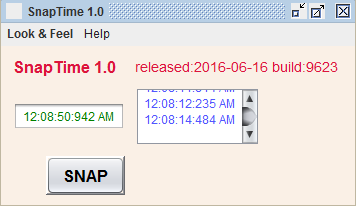 SnapTime online as an Applet in your browser, without installing it on your computer. for the current version of SortedArrayList and Merge. SortedArrayList and Merge class to merge and deDup SortedArrayLists in various ways. 296K zip for SortedArrayList and Merge Java source and compiled class files to run on your own machine as a part of your own program. access sorted source in repository with [Tortoise] Subversion client on wush.net/svn/mindprod/com/mindprod/sorted/. download ASP PAD XML program description for the current version of SortedArrayList and Merge. SortedArrayList and Merge is free. Full source included. You may even include the source code, modified or unmodified in free/commercial open source/proprietary programs that you write and distribute. Non-military use only. for the current version of SortSRS. 1,045K zip for SortSRS Java source, compiled class files, jar and documentation to run on your own machine as an application. access sortsrs source in repository with [Tortoise] Subversion client on wush.net/svn/mindprod/com/mindprod/sortsrs/. 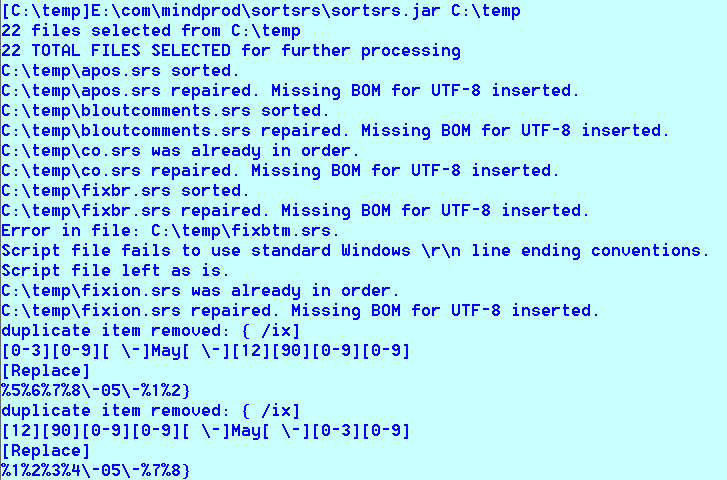 download ASP PAD XML program description for the current version of SortSRS. SortSRS is free. Full source included. You may even include the source code, modified or unmodified in free/commercial open source/proprietary programs that you write and distribute. Non-military use only. for the current version of Sound. Generate sound mathematically in Java. Create AU files. 81K zip for Sound Java source and compiled class files to run on your own machine as a part of your own program. access sound source in repository with [Tortoise] Subversion client on wush.net/svn/mindprod/com/mindprod/sound/. 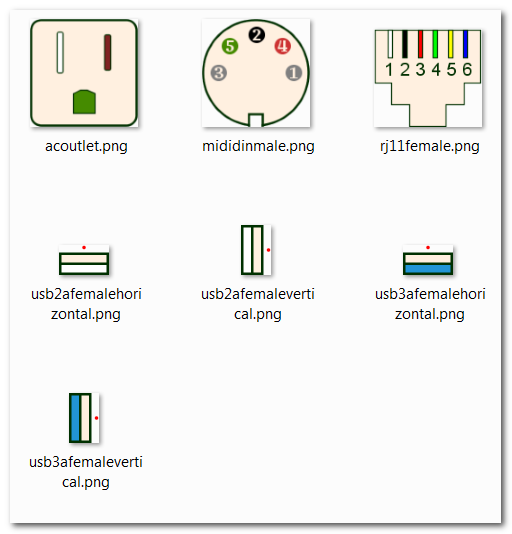 download ASP PAD XML program description for the current version of Sound. Sound is free. Full source included. You may even include the source code, modified or unmodified in free/commercial open source/proprietary programs that you write and distribute. Non-military use only. on the current version of Speaker. Generate tones on the built-in PC Speaker from Java. Uses JNI. Written by Martin Mosisch, not CMP. 18K zip for Speaker Java source and compiled class files to run on your own machine as a part of your own program. Speaker is free. Full source included. You may even include the source code, modified or unmodified in free/commercial open source/proprietary programs that you write and distribute. Non-military use only. 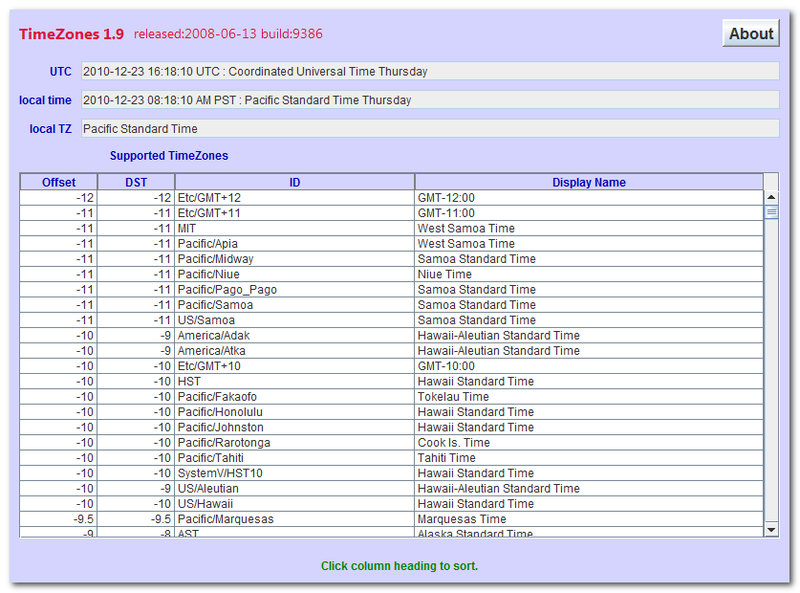 TimeZones online as an Applet in your browser, without installing it on your computer. for the current version of WaveLength. 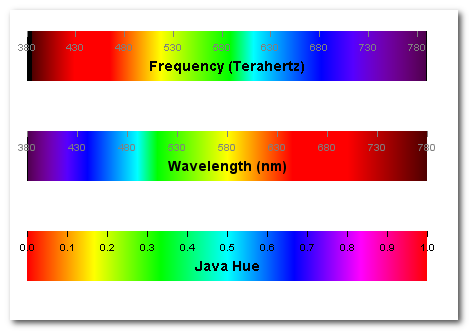 Calculate Color given wavelength in nanometers or frequency of light in Terahertz. Draw pretty rainbows. 501K zip for WaveLength Java source and compiled class files to run on your own machine as a part of your own program. access wavelength source in repository with [Tortoise] Subversion client on wush.net/svn/mindprod/com/mindprod/wavelength/. download ASP PAD XML program description for the current version of WaveLength. WaveLength is free. Full source included. You may even include the source code, modified or unmodified in free/commercial open source/proprietary programs that you write and distribute. Non-military use only.